Joseph Tepperman and Emily Nava, Long-distance rhythmic dependencies and their application to automatic language identification. In Proceedings of Interspeech, Florence, Aug. 2011. Joseph Tepperman and Emily Nava, Where should pitch accents and phrase breaks go? A syntax tree transducer solution. In Proceedings of Interspeech, Florence, Aug. 2011. Emily Nava, Louis Goldstein, and Joseph Tepperman, "Measuring and modeling rhythm distributions: The contribution of forced alignment", in Proc. 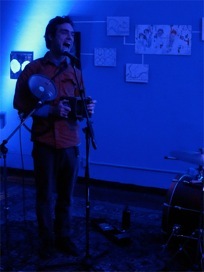 of VLSP, Philadelphia, January 2011. Kadri Hacioglu, Theban Stanley, and Joseph Tepperman, System and method for measuring speech characteristics, US Patent App. 12/696,222, 2010. Kadri Hacioglu, Theban Stanley, and Joseph Tepperman, System and method for teaching non-lexical speech effects, US Patent App. 12/878,402, 2010. Joseph Tepperman and Shrikanth Narayanan. Tree Grammars as Models of Prosodic Structure. In Proceedings of InterSpeech ICSLP, Brisbane, Australia, September 2008. Jing Zheng and Joseph Tepperman, Rhythm analysis of second-langauge speech through low-frequency auditory features. In Proceedings of Interspeech, Lyon, Aug. 2013. Mahnoosh Mehrabani, Joseph Tepperman, and Emily Nava, Nativeness Classification with Suprasegmental Features on the Accent Group Level. In Proceedings of Interspeech, Portland, Sept. 2012. Emily Nava and Joseph Tepperman, Methods and Systems for Teaching a Nonnative Language, US Patent App. 13/314,697, 2011. Emily Nava and Joseph Tepperman, Modeling second language prosody acquisition: A dynamic systems theory approach. In Proceedings of BUCLD 35, Boston, 2011. Joseph Tepperman, Theban Stanley, Kadri Hacioglu, and Bryan Pellom, Testing Suprasegmental English Through Parroting. In Proceedings of Speech Prosody, Chicago, May 2010. Emily Nava and Joseph Tepperman, "Modeling second language prosody acquisition: A dynamic systems theory approach," BUCLD 35, Boston, November 2010. Emily Nava, Joseph Tepperman, Louis Goldstein, Maria Luisa Zubizarreta, and Shrikanth Narayanan, Connecting Rhythm and Prominence in Automatic ESL Pronunciation Scoring. In Proceedings of Interspeech, Brighton, September 2009. Joseph Tepperman, Hierarchical Methods in Automatic Pronunciation Evaluation. PhD Dissertation, University of Southern California, August 2009. Joseph Tepperman and Shrikanth Narayanan. Better Nonnative Intonation Scores Through Prosodic Theory. In Proceedings of InterSpeech ICSLP, Brisbane, Australia, September 2008. Joseph Tepperman and Shrikanth Narayanan, Using Articulatory Representations to Detect Segmental Errors in Nonnative Pronunciation. IEEE Transactions on Audio, Speech, and Language Processing, 16(1):8-22, January 2008. Joseph Tepperman, Abe Kazemzadeh, and Shrikanth Narayanan. A Text-free Approach to Assessing Nonnative Intonation. In Proceedings of InterSpeech ICSLP, Antwerp, Belgium, August 2007. Abe Kazemzadeh, Joseph Tepperman, Jorge Silva, Hong You, Sungbok Lee, Abeer Alwan, and Shrikanth Narayanan. Automatic detection of voice onset time contrasts for use in pronunciation assessment. In Proceedings of InterSpeech ICSLP, Pittsburgh, PA, September 2006. Joseph Tepperman, Jorge Silva, Abhinav Sethy, and Shrikanth Narayanan. Robust recognition and assessment of non-native speech variability. In Proceedings of International Conference on Intelligent Systems And Computing: Theory And Applications, Ayia Napa, Cyprus, July 2006. Invited paper. Joseph Tepperman and Shrikanth Narayanan. Hidden-articulator markov models for pronunciation evaluation. In Proceedings of ASRU, San Juan, Puerto Rico, November 2005. Joseph Tepperman and Shrikanth Narayanan. Automatic syllable stress detection using prosodic features for pronunciation evaluation of language learners. In Proceedings of ICASSP, Philadelphia, PA, March 2005. Joseph Tepperman and Shrikanth Narayanan. "Spoken Name Pronunciation Evaluation." J. Acoust. Soc. Am., 116:2480, 2004. Joseph Tepperman, Erik Bresch, Yoon-Chul Kim, Sungbok Lee, Louis Goldstein, and Shrikanth Narayanan, An Articulatory Analysis of Phonological Transfer Using Real-Time MRI, in Proceedings of Interspeech, Brighton, September 2009. Joseph Tepperman, Louis Goldstein, Sungbok Lee, and Shrikanth Narayanan, Automatically Rating Pronunciation Through Articulatory Phonology, in Proceedings of Interspeech, Brighton, September 2009. Joseph Tepperman, Erik Bresch, Yoon-Chul Kim, Louis Goldstein, Dani Byrd, Krishna Nayak, and Shrikanth Narayanan. "Articulatory analysis of foreign-accented speech using real-time MRI." J. Acoust. Soc. Am., 125(4):2753, 2009. Matthew Black, Abe Kazemzadeh, Joseph Tepperman, and Shrikanth Narayanan, Automatically Assessing the ABCs: Verification of Children's Spoken Letter-Names and Letter-Sounds, ACM Transactions on Speech and Language Processing, 7(4), August 2011. Matthew Black, Joseph Tepperman, and Shrikanth Narayanan, Automatic Prediction of Children's Reading Ability for High-level Literacy Assessment. IEEE Transactions on Audio, Speech, and Language Processing, 19(4):1015-1028, May 2011. Joseph Tepperman, Sungbok Lee, Shrikanth Narayanan, and Abeer Alwan, A Generative Student Model for Scoring Word Reading Skills. IEEE Transactions on Audio, Speech, and Language Processing, 19(2):348-360, February 2011. Patti Price, Joseph Tepperman, Markus Iseli, Thao Duong, Matthew Black, Shizhen Wang, Christy Kim Boscardin, Margaret Heritage, P. David Pearson, Shrikanth Narayanan, and Abeer Alwan, Assessment of Emerging Reading Skills in Young Native Speakers and Language Learners. Speech Communication, 51(10):968-984, October 2009. Matthew Black, Joseph Tepperman, Sungbok Lee, and Shrikanth Narayanan, Predicting Children's Reading Ability using Evaluator-Informed Features, in Proceedings of Interspeech, Brighton, September 2009. Matthew Black, Joseph Tepperman, Abe Kazemzadeh, Sungbok Lee, and Shrikanth Narayanan, Automatic Pronunciation Verification of English Letter-names for Early Literacy Assessment of Preliterate Children, in Proc. of ICASSP, Taipei, April 2009. Joseph Tepperman, Matteo Gerosa, and Shrikanth Narayanan. A generative model for scoring children's reading comprehension. In Proc. of the Workshop on Child, Computer, and Interaction, Chania, Greece, October 2008. Shrikanth Narayanan, Abe Kazemzadeh, Matthew Black, Joseph Tepperman, Sungbok Lee, and Abeer Alwan. "Letter sound and letter name recognition for automated literacy assessment of young children." J. Acoust. Soc. Am., 123(5):3327, 2008. Matthew Black, Joseph Tepperman, Sungbok Lee, and Shrikanth Narayanan. Estimation of Children's Reading Ability by Fusion of automatic Pronunciation Verification and Fluency Detection. In Proceedings of InterSpeech ICSLP, Brisbane, Australia, September 2008. Matthew Black, Joseph Tepperman, Abe Kazemzadeh, Sungbok Lee, and Shrikanth Narayanan. Pronunciation Verification of English Letter-Sounds in Preliterate Children. In Proceedings of InterSpeech ICSLP, Brisbane, Australia, September 2008. Abeer Alwan, Yijian Bai, Matt Black, Larry Casey, Matteo Gerosa, Margaret Heritage, Markus Iseli, Barbara Jones, Abe Kazemzadeh, Sungbok Lee, Shrikanth Narayanan, Patti Price, Joseph Tepperman, and Shizhen Wang. A system for technology based assessment of language and literacy in young children: the role of multiple information sources. In Proceedings of IEEE International Workshop on Multimedia Signal Processing, Chania, Greece, October 2007. Joseph Tepperman, Matthew Black, Patti Price, Sungbok Lee, Abe Kazemzadeh, Matteo Gerosa, Margaret Heritage, Abeer Alwan, and Shrikanth Narayanan. A Bayesian Network Classifier for Word-level Reading Assessment. In Proceedings of InterSpeech ICSLP, Antwerp, Belgium, August 2007. Matthew Black, Joseph Tepperman, Sungbok Lee, Patti Price, and Shrikanth Narayanan. Automatic Detection and Classification of Disfluent Reading Miscues in Young Children's Speech for the Purpose of Assessment. In Proceedings of InterSpeech ICSLP, Antwerp, Belgium, August 2007. Joseph Tepperman, Jorge Silva, Abe Kazemzadeh, Hong You, Sungbok Lee, Abeer Alwan, and Shrikanth Narayanan. Pronunciation verification of children's speech for automatic literacy assessment. In Proceedings of InterSpeech ICSLP, Pittsburgh, PA, September 2006. Joseph Tepperman, David Traum, and Shrikanth Narayanan. Yeah right: Sarcasm recognition for spoken dialogue systems. In Proceedings of InterSpeech ICSLP, Pittsburgh, PA, September 2006.